It's piano tuning day, the old Charles R. Walter, "Chuck," for short, getting it's first tuning in we don't know how many years. 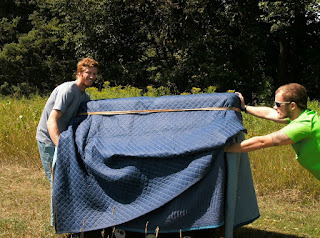 The piano arrived here in upper Michigan seven or eight weeks ago, completing its journey from California begun just a few weeks earlier. Along with the piano, of course, came the piano bench, and how nice it was that all contents of said bench were able to make the trip. I figured there would be some music in there, which would be nice, because all I had left from my previous lives as a piano owner were a Duke Ellington songbook, a copy of Sheet Music Magazine from January/February 1993 (with the music to One Morning in May), Albert E. Brumley's Songs of the Pioneers, and two small booklets of Christmas carols, family heirlooms dating back to our roots in Aledo, Illinois. Scott Joplin Collected Piano Works, Third Printing 1972. Taped binding; pencil marks; large paper clip on page 27 (Maple Leaf Rag); scrap of paper tucked between pages 30 and 31 (Peacherine Rag); between pages 68 and 69 a folded and tattered page 303-304 along with a newspaper clipping, Scott Joplin: The Life of a Master Miniaturist; large paper clip on pages 235-240 (Reflection Rag [Syncopated Musings] and "Swipesy"). Broadway Musicals Show by Show 1917-1929: A Musical and Historical Look at Broadway's Biggest Hits Based on the Best-Selling Book by Stanley Green, copyright 1991. Paper clips at page 85, Manhattan (from "Garrick Gaieties"), page 95, The Birth of the Blues (from "George White's Scandals of 1924"), and page 99, St. Louis Blues. A 3x5 post-it stuck on page 145, Why Do I Love You?, with a handwritten list of page numbers and song titles. A yellow, laminated bookmark printed with "Footprints in the Sand" by Mary Stevenson and a blue, bow-tied ribbon attached to the top, stuck between pages 148-49, How Long Has this Been Going On? Service Order and Invoice from Perfection Piano Co., Downers Grove, Illinois. The total for the piano with the trade-in of a George Steck baby grand was $4,000. The date of order was 3/26/01.